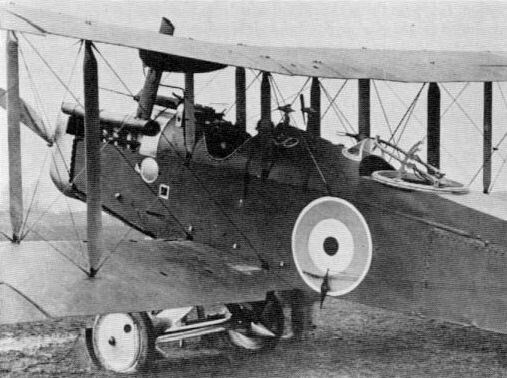 Bristol Fighter F2B, showing port for Vickers gun above radiator, sight attachments on upper centre-section. 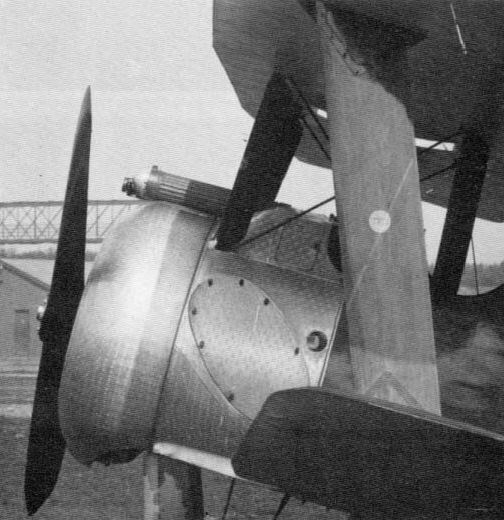 Scarff ring-mounting, and bomb rails for two 20-lb carriers beneath lower wings. A Browning Model 1918, M1, Cal .30 aircraft machine-gun (top) is shown installed in a Bristol Fighter of the RAF. The original photographs have been somewhat "doctored", but there is no doubting the authenticity of the installation. 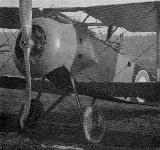 D.H.5. showing Vickers gun with hydraulic lead from engine-driven generator to trigger motor on top of gun. 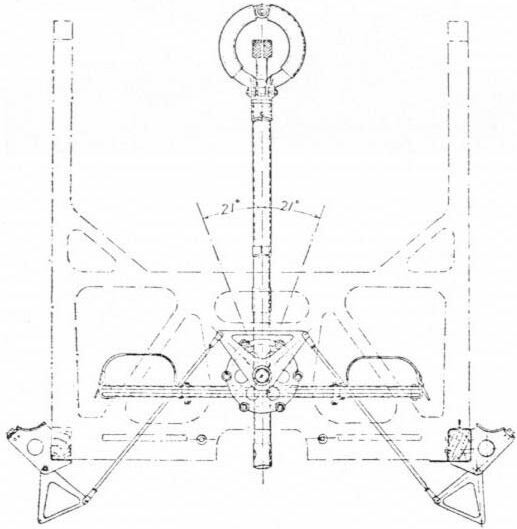 Official drawing of D.H.5, showing brackets for mounting gun and hydraulic lead running to Type A1 trigger motor. 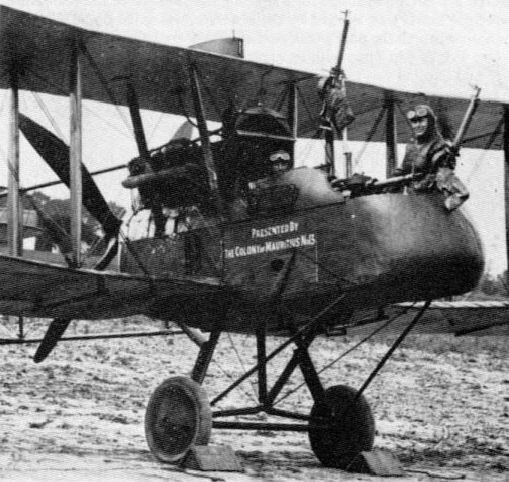 Vickers gun, with Vickers synchronising gear, on B.E.12. A Strange mounting for a Lewis gun is also seen. 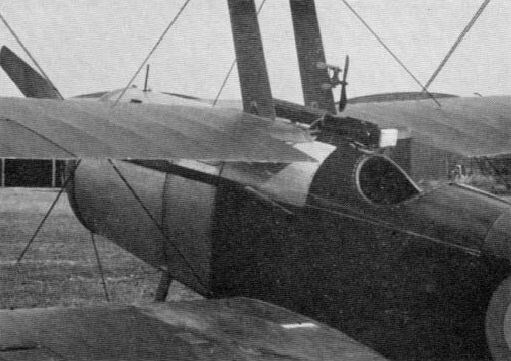 Note the chute for leading the webbing belt of the Vickers gun back into the fuselage. 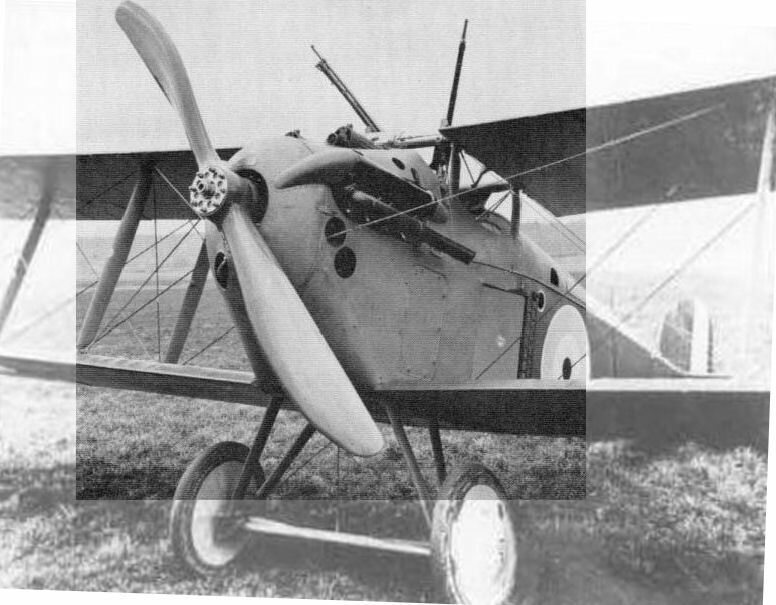 Early F.E.2d with two partially faired pillar mountings for a Lewis gun. 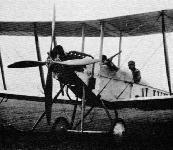 F.E.2d with two free Lewis guns and one fixed. Note also rails for bomb-carriers under wings. The nearest line of S.E.5as in production display a cut-out in the forward bulkhead for the Vickers gun. In the second line the Vickers gun is already installed, at least in the aircraft the Service number of which is largely visible. In the third line the Foster mounting is in place. Note access panel for Vickers gun, with built-in ejection chute, on two aircraft at top right. 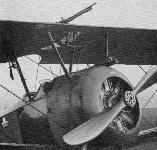 Vickers-gun installation on Sopwith Pup, showing feed chute and access panel for belt box. 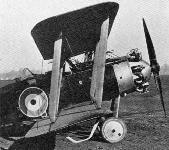 Standard Sopwith Triplane, with Sopwith padded screen at rear of Vickers gun. 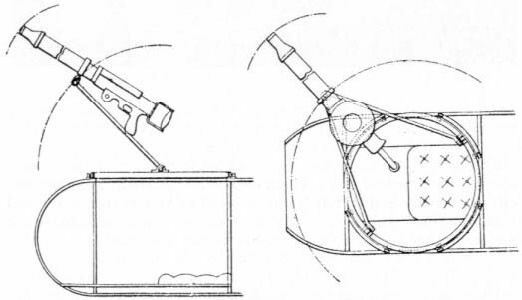 How ihe Camel's hump developed: top, first Camel with original form of fairing over breech casings of guns; lower, second Camel with revised fairings for guns. 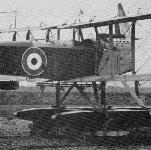 The third (tapered-wing) Camel, showing immaculate gun installation and fairings at front end of guns. 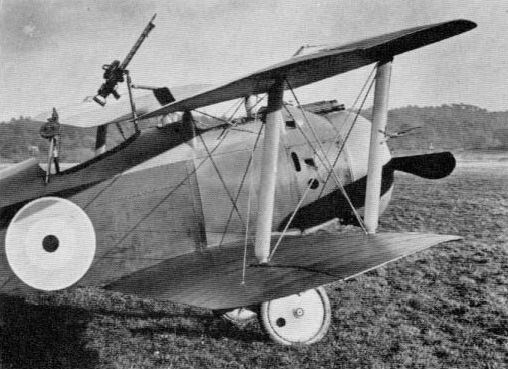 The Camel at war, with a gun installation that is hardly immaculate, since the addition of chutes, sights, screen and, in this instance, a camera gun to port. 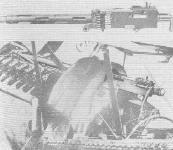 The view of the same aircraft below left shows the 'crossbar' mounted, upward-firing Lewis guns that could prove so dangerous. The windscreen is perforated for an Aldis sight, but the sight is not installed. Note also gear ring behind propeller hub, smaller gear wheel below it and part of generator and pipeline for starboard Vickers gun. 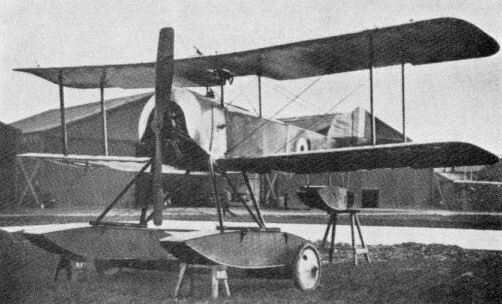 Another comparative view of the Salamander and Snipe, in production at Sopwith's Ham works in December 1918. Note staggered Vickers gun installation on Salamander (front row) and flat sides. 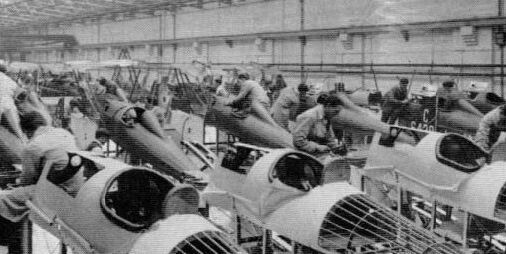 A third Salamander Snipe comparison, with the Salamanders in the foreground exhibiting not only the armoured forward fuselage but the staggered gun-mountings. 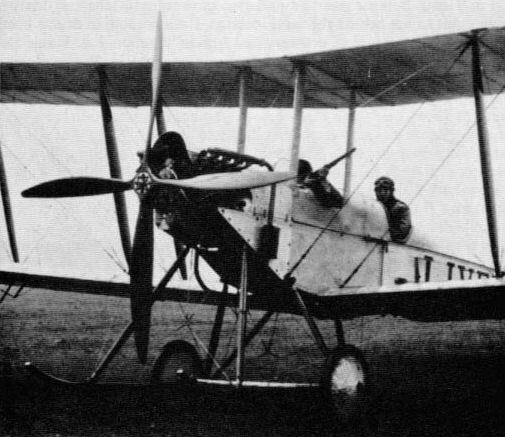 An historic picture, showing King George V in the cockpit of a Handley Page O/100. The gun-mounting on the O/100 is of the Scarff 'disappearing-quadrant' type. 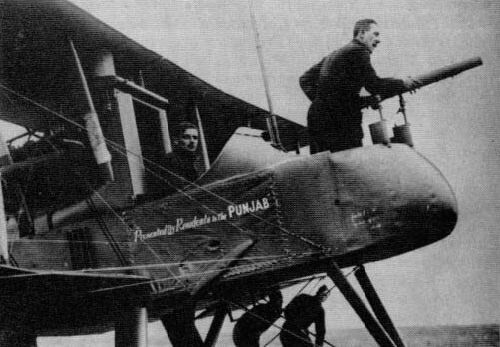 Although the wartime Handley Page bombers had internal bomb stowage, the postwar Hyderabad and Hinaidi carried their bombs externally. 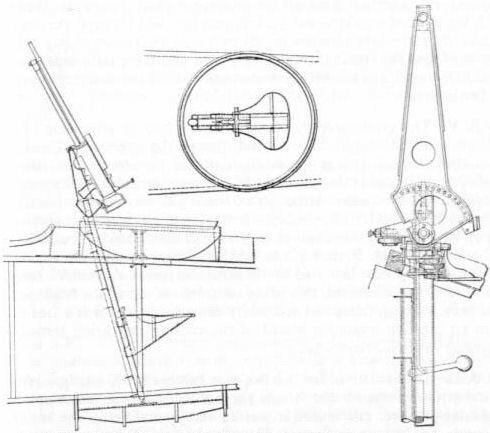 The four transverse bomb beams in the O/400 are seen in the drawing. 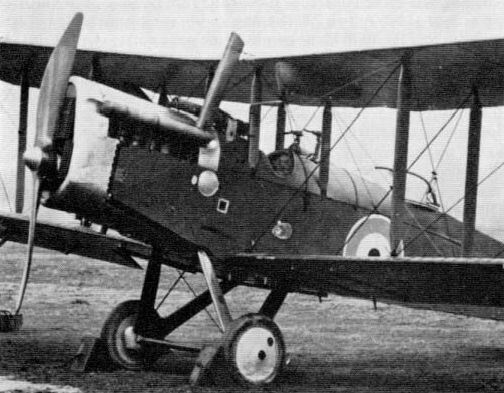 Short Bomber with four 112-lb bombs on carriers devised by the makers themselves. The ring-mounting for the Lewis gun is not of Scarff type, though a Scarff compensating sight may be fitted. 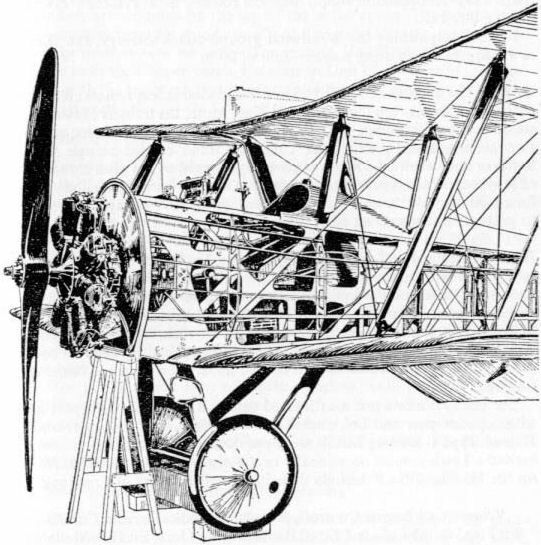 Official drawing of Armstrong Whitworth F.K.3. 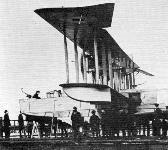 showing the communal cockpit with the 'gun rail' at the rear. 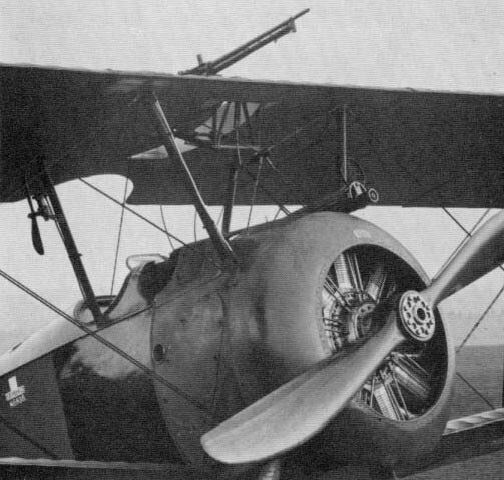 View of Vickers F.B.5 Gun Bus with Lewis gun on simple spigot mounting. 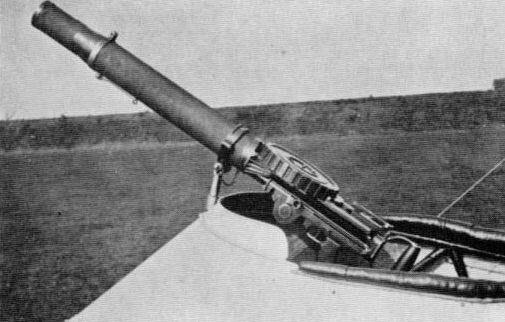 Lewis gun on spigot mounting on Vickers F.B.5. The ammunition drum held 47 rounds. 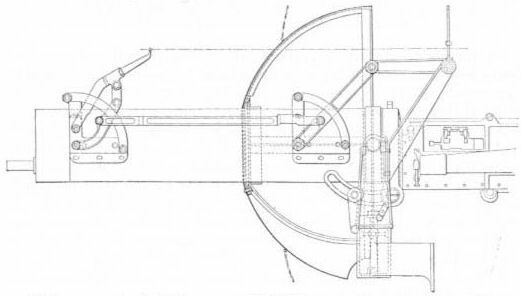 Though not to scale, this Vickers drawing shows salient features of the mounting designed for the Gun Bus by G H. Challenger. D.H.4, showing bomb rails under wings and fuselage, at differing angular setting, owing to wing incidence. 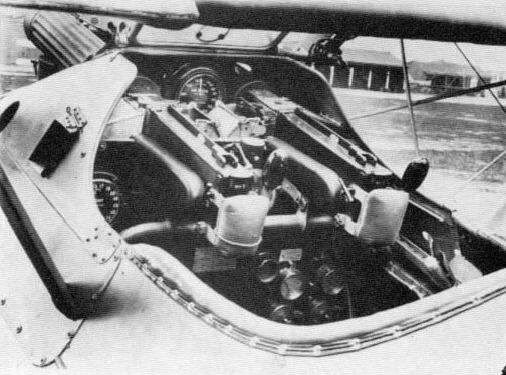 Vickers gun and ejection chute in fuselage flank, and Scarff ring-mounting, with windscreen ahead of it. 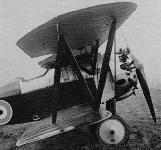 D.H.4, showing, in particular, the Scarff ring-mounting installation. 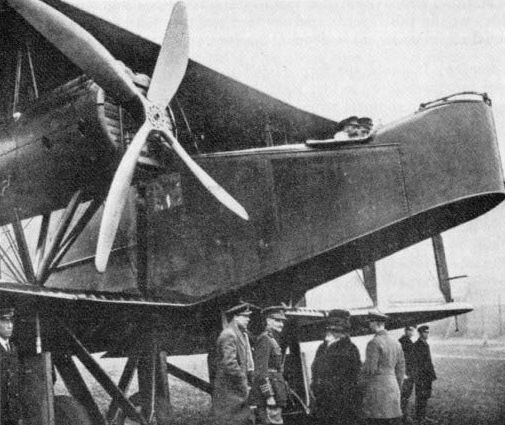 In the light of the DH 9's palpable failure, steps were initiated to replace the underpowered Siddeley Puma with something a little more powerful and tractable in the shape of the 375hp Rolls-Royce Eagle VIII, the work being given to Westland towards the end of 1917. 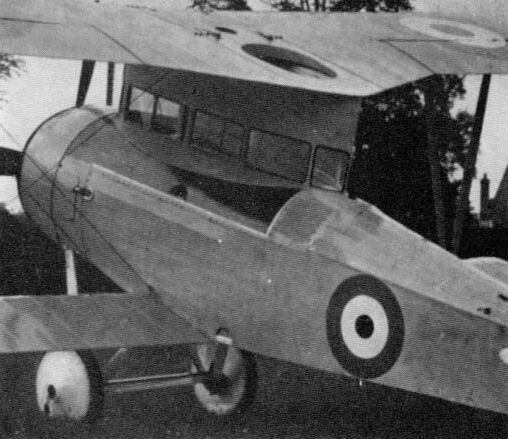 Once flight testing got underway on the first Airco DH 9a, previously DH 9, serial no B7664, seen here, good things transpired, with the injection of extra power boosting the two seater's top level speed to 125.5mph, from the DH 9's 114mph without bomb load and from 109.5mph to 118mph with full bomb load - all at 10,000 feet. 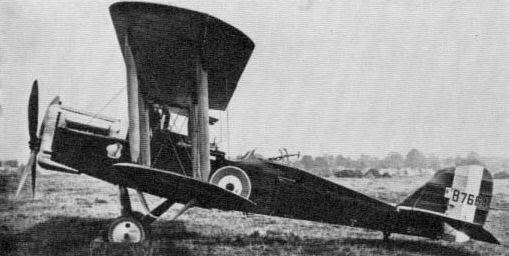 First flight of the prototype DH 9a occurred in February 1918, with initial deliveries of this reconnaissance bomber, to No 110 Squadron, RAF, following in August 1918. 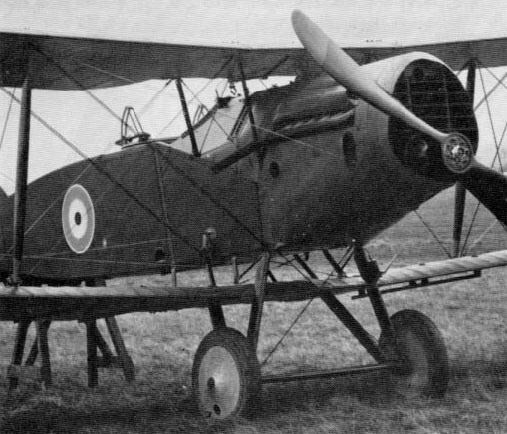 Sadly, at the time of the Armistice, only 885 examples of the DH 9a had been produced out of the 3,000 machines on order from Airco and five sub-contractors. 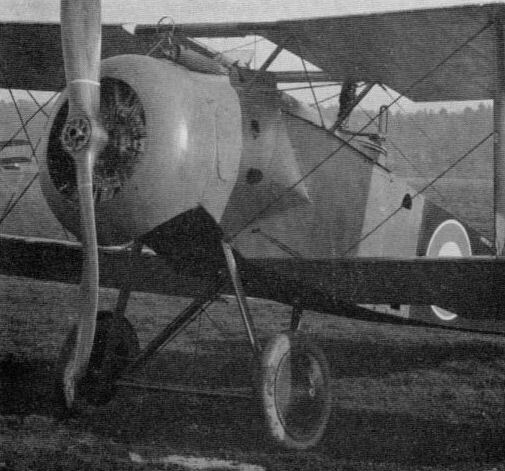 Equally sadly for many DH 9 crews who were not to survive, the comparative handful of the much improved DH 9a machines that did reach the front arrived far too late. 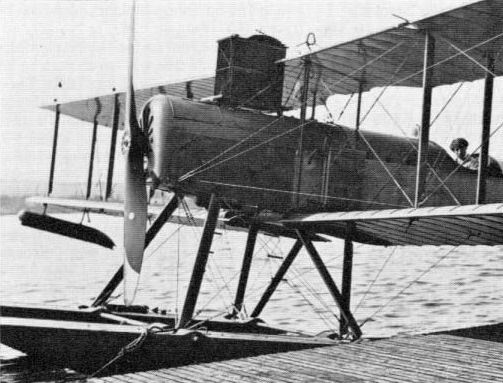 Eagle-engined D.H.9A prototype, showing details of gun installations, ring-and-bead sight to port and clamps for Aldis sight to starboard. Note how windscreen has been cut away to clear eyepiece of Aldis sight. Liberty-engined D.H.9A. 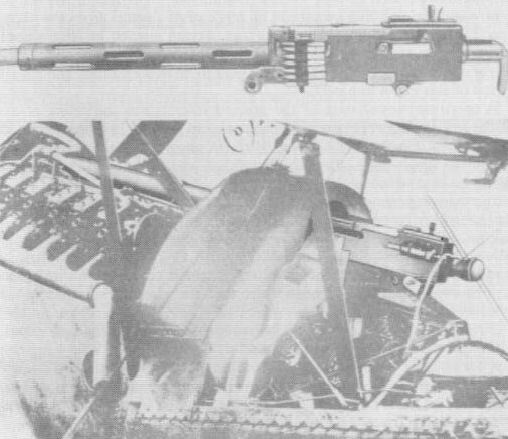 showing revised ejection chute on Vickers gun and Aldis sight in position. 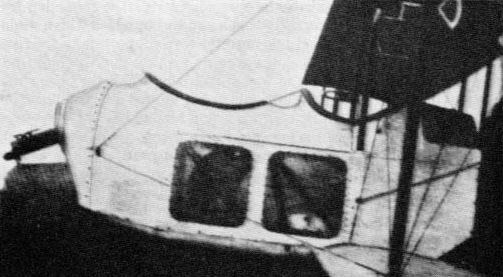 Although the pilot's windscreen has been perforated lo receive the eyepiece, the hole is not here used. 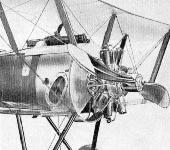 Showing how essential features of the D.H.9A were reproduced in the Stag. Note, however, that, being built to an official general purpose requirement, the Stag retains the Scarff ring-mounting and has a prone bomb-aimer's station, betokened by windows. 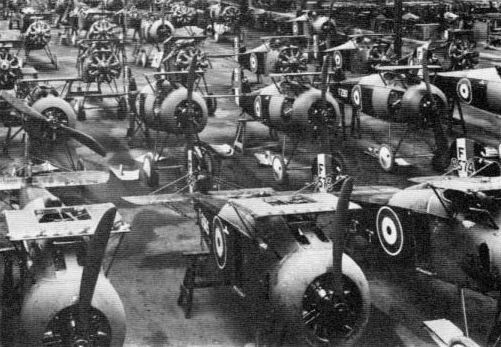 A requirement to use up spares for the D.H.9A resulted in a strong resemblance between intended replacement types. 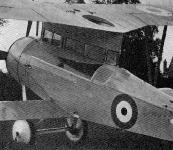 Shown is de Havilland's own submission, the Stag. The Stag carries two 250-lb bombs. Demonstrating the use of a Lee-Metford carbine from an early B.E.2c. 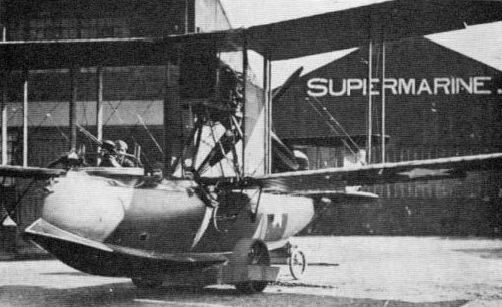 Supermarine Channel, with Lewis gun manned in bow. The gun has a 'single' (47-round) ammunition drum, and there are bomb-carriers under the wings. Recorded in the text are new facts concerning the remarkable Blackburn Blackburd, the frontal portion of which is shown at left and the torpedo installation at right. 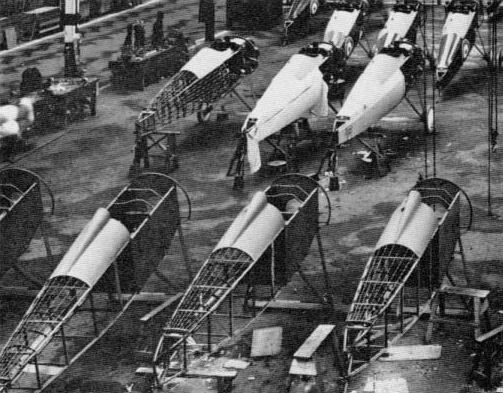 The two sets of torpedo crutches on the Blackburd are seen at left. 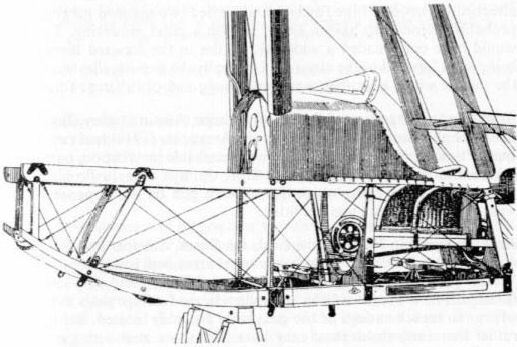 The second picture shows the lever near the pilot's wicker seat. This singular device performed a plurality of functions, as described in the text. 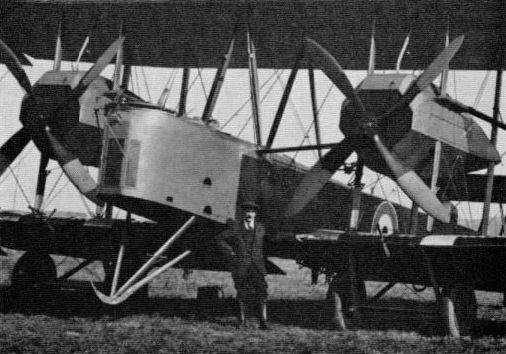 Fashions in fighter armament: lBoulton & Paul Bobolink of 1918, with twin Vickers guns over cowling. Boulion & Paul Bourges with normal Scarff ring-mouniing for twin Lewis guns. 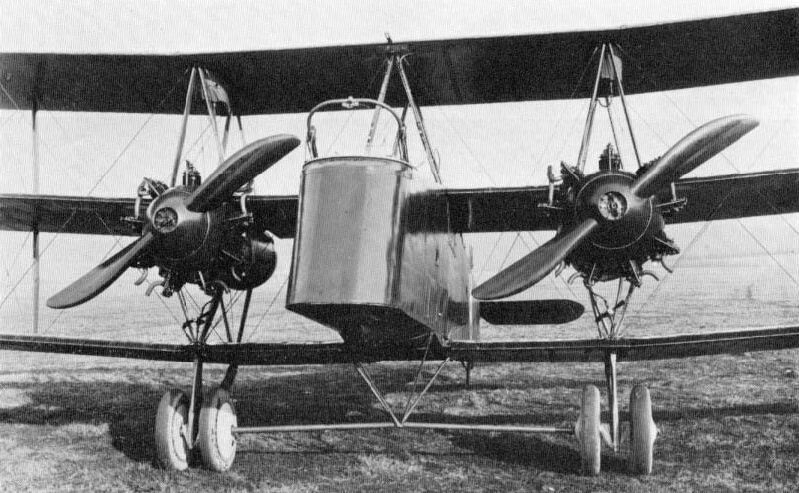 The shutter-like bomb doors are just visible between the split axles of the undercarriage. Gull-wing Bourges with unusual form of Scarff ring-mouniing. 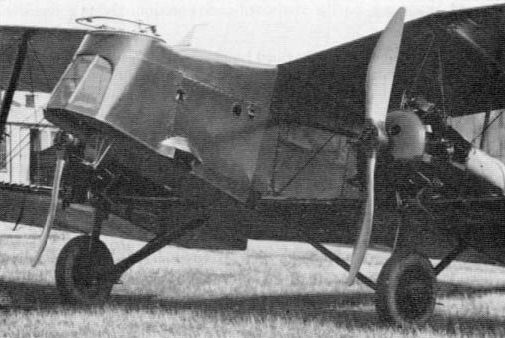 The shutter-like bomb doors are just visible between the split axles of the undercarriage. 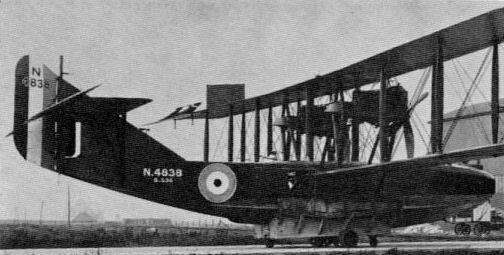 Lion-engined Bourges, showing unusual Scarff ring-mountings for twin guns in nose and dorsal positions. 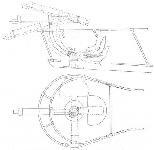 Official drawings of the unusual form of Scarff ring-mounting as installed on the gull-wing and Lion-engined Bourges. 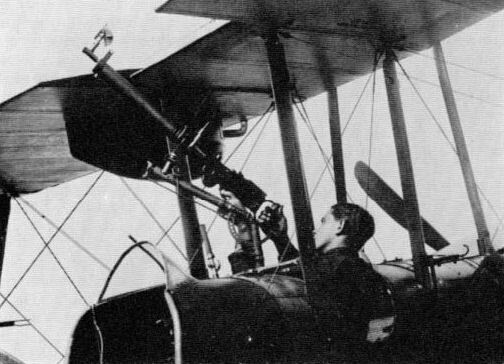 Vickers gun installation on Bristol Scout F.
Slandard RAF control column with gun-firing levers, in the Nieuport Nighthawk. 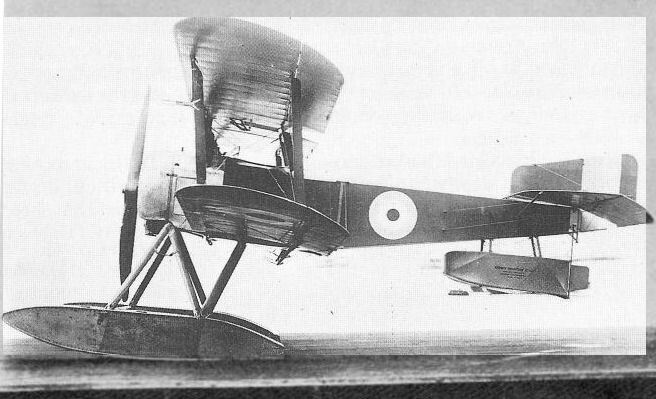 The Fairey IIIB was typical of British 1914-18 floatplanes in having tubular bomb-carriers suspended well below the fuselage. In this instance they are for two 230-lb bombs. Note also recessed Scarff ring-mounting. In this view of F.2A number 8677 a man is obstructing the waist hatch. Clearly, however, the mounting above the hatch is not of the Scarff No.2 type, and there is doubt, moreover, if the mounting in the bow is of this pattern. Even the Lewis guns appear non-standard. Beneath the wing is a flat-nosed 230-lb anti-submarine bomb. 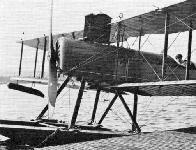 Although in this picture of an F.5 the guns and mountings are not installed it affords an excellent idea of the fields of fire possible with the beam guns, mounted at the sliding hatches amidships. F.5 (Metal Hull) with Scarff ring-mountings in bow and amidships. 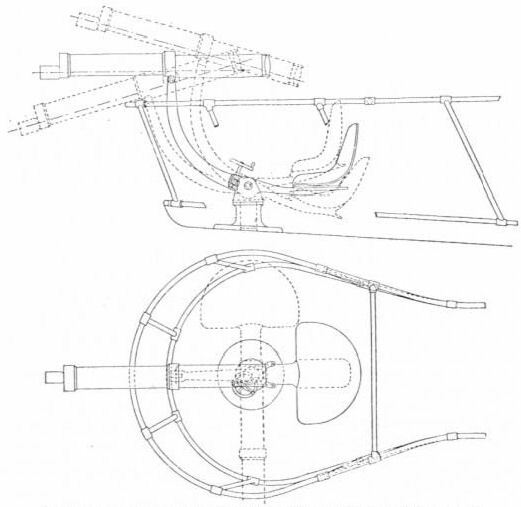 Forward of the instrument board of the Martinsyde F.4 Buzzard is a tubular frame with fittings for attachment to the rear trunnions of the two Vickers guns. The reservoir for the C.C. synchronising gear is seen at the right, but the top of the control column, with firing levers, is absent. Official drawing showing Hispano-Suiza engine and gun installation of Martinsyde F.4 Buzzard. The original caption affixed to this news-agency photograph reads: 'WAR SCENES. 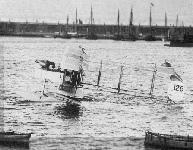 ENGLAND MAKES READY HER AERIAL FLEET. Seaplane No. 126 all ready in Ramsgate Harbour to go off at a moment's notice, she has one of the latest machine guns fitted and only awaits the order to go.' Clearly, however, the weapon is the 1 1/2-pounder Vickers gun, inherited by Short S.81 No.126 from Sopwith No. 127. 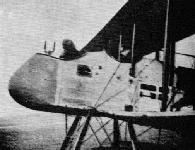 The Short 184 Type D carried nine 65-lb bombs internally, the location of the bomb beams being indicated in the original of this photograph by three dark fittings on the side of the fuselage forward of the cockpit. The first Sopwiih Buffalo, with rocking-pillar mounting for Lewis gun. 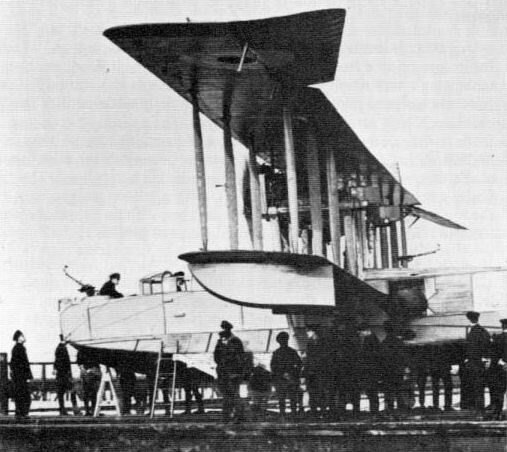 The second Buffalo, with Scarff ring-mounting. Note extent of armouring in this view. 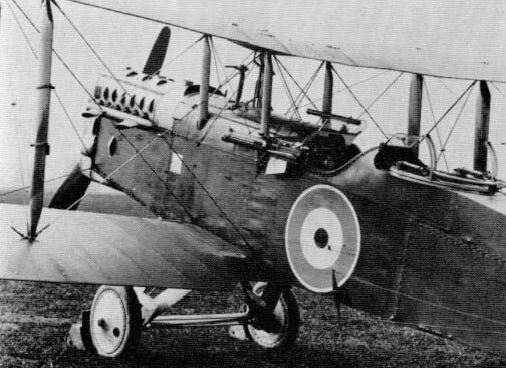 Sopwith Baby with synchronised Lewis gun and bomb-carriers. Sopwith Baby with Lewis gun through centre-section. 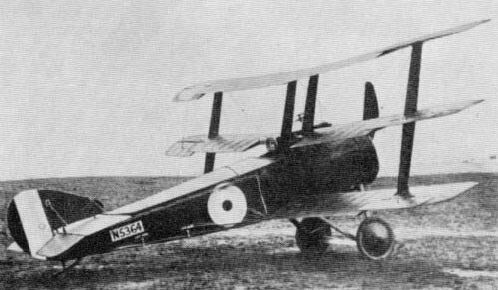 The fuselage of the Sopwith Swallow was that of the Camel, but the gun installation differed and the guns were more widely spaced, as seen. 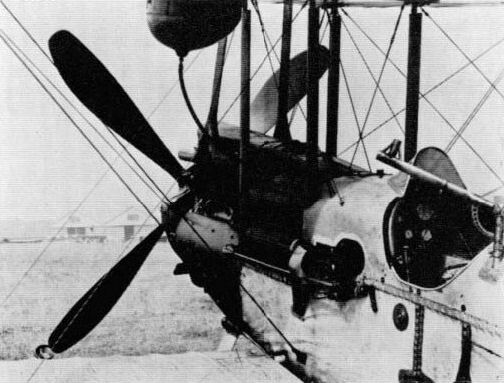 Vickers Vimy, showing bombsight mounted on nose forward of Scarff ring-mounting, bomb-carriers and - glimpsed through the lower blades of the port airscrew - dorsal Scarff ring-mounting for twin Lewis guns. Lewis gin on Strange mounting between cockpits of B.E.2e. Lewis gun on 'candlestick' mountong on B.E.2e. 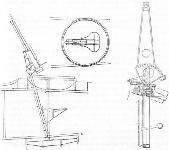 Mounting for Vickers gun designed by Lt C. J. L'Estrange Malone of the Admiralty's Air Department for the Vickers Destroyer, or E.F.B.1. 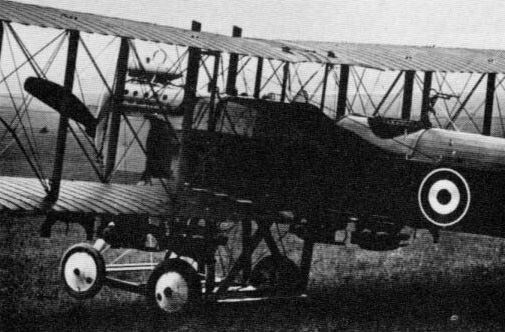 Dyott Bomber with second form of nose, showing three Lewis guns with land-service type cooling jackets, sights and ammunition drums, but with spade grip in place of stock. 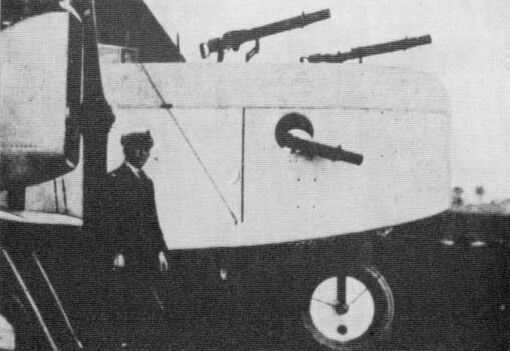 Solution to the problem of attaining a wide field of fire: Robey-Peters Gun Carrier with emplacements on top wings. 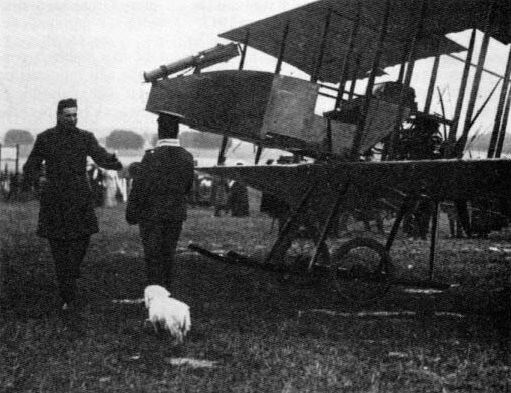 An historic picture showing the F.E.2 with Gnome engine and Maxim gun. Rebuilt F.E.2 with Renault engine and mounting for large gun. 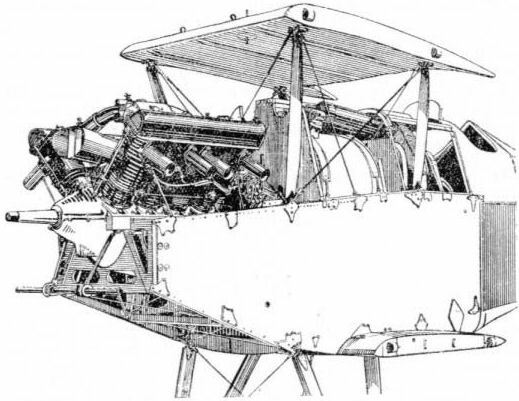 Nacelle of Vickers E.F.B.2 with Vickers mounting of the type illustrated in the accompanying drawing. 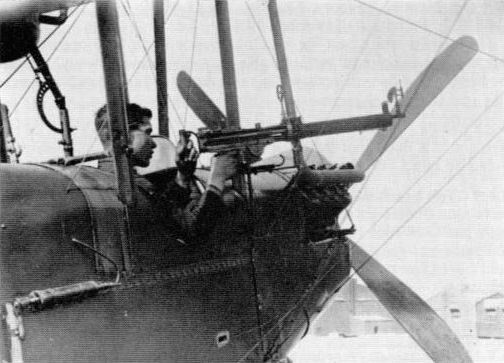 Vickers mounting for Vickers gun on E.F.B.2. a very advanced scheme which preceded far more primitive installations. 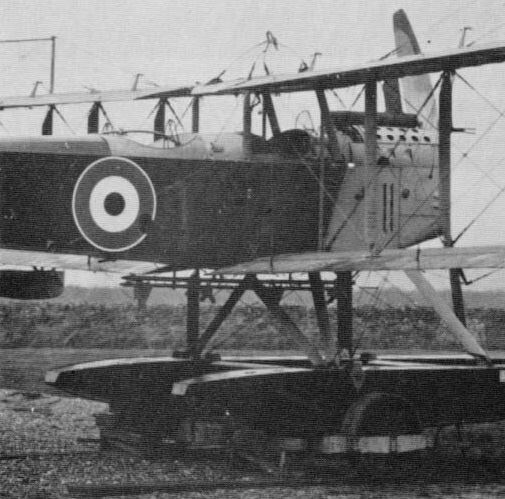 Vickers mounting for Vickers automatic 1-pounder gun. 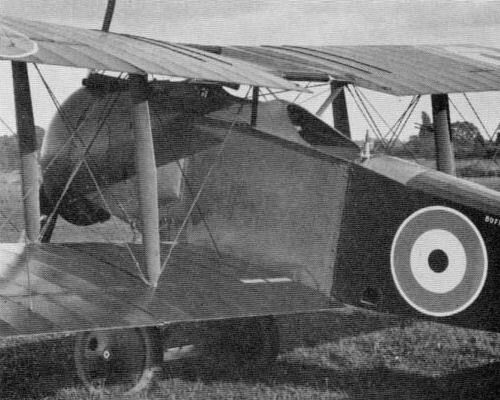 The author suggests that this mounting was intended for the Vickers F.B.24E and Martinsyde F.1. Although not itself successful, the A.D. Type 1000 was a very notable early example of how armament could influence the design of aircraft. 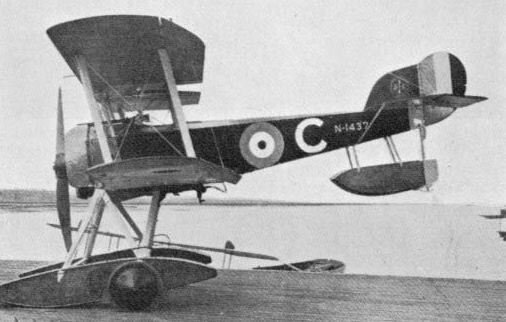 The two floats were independently mounted, one beneath each fuselage, allowing a clear drop for the torpedo or bomb load. 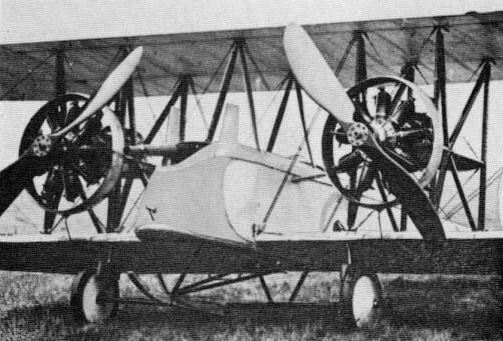 In this picture no engines are installed. 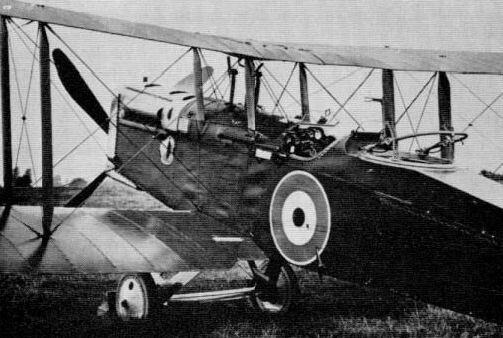 Short Type 320, showing installation of Scarff ring-mounting behind cut-out in top wing. One of the finest studies of any Sopwith aeroplane (and likewise A.B.C. 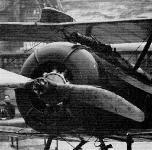 Dragonfly engines installed) is this close-up of the Cobham Mk.I. 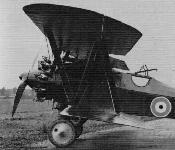 This was the second Cobham to fly, and the full maker's caption reads: "S.1259 - Cobham No. 2. 360 hp A.B.C. Twin Engines. Designed and built by The Sopwith Aviation & Engineering Co Ltd - March 4/1920". 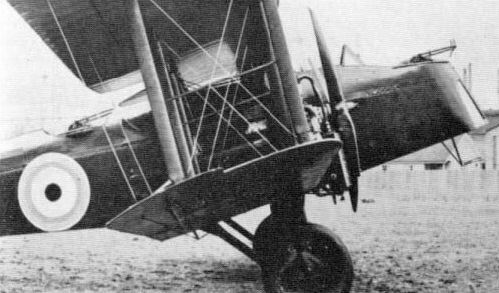 In this view of the Sopwith Cobham the location of the bomb compartment is seen through the inverted-pyramid tubular structure which anchors ihe undercarriage. On the Scarff ring-mounting the lever for locking and unlocking ihe mechanism is seen. Westland Weasel two-seat fighter, showing pilot's fixed Vickers guns and installation of Scarff ring-mounting. 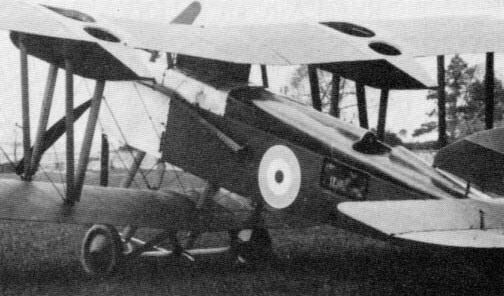 Fairey-built Hamble Baby N1452 with 110/130 hp Clerget. The full-span trailing-edge flaps can be seen as well as the differences between Falrey- and Parnall-built examples. 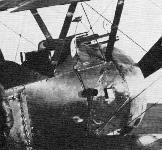 Fairey Hamble Baby, showing evidence of Lewis gun associated with centre section cut-out and attachment for bomb-carrier under fuselage. Vickers gun and Scarff ring-mouniing on Bristol Badger. The Sopwith Bulldog had unusual and heavy armament. 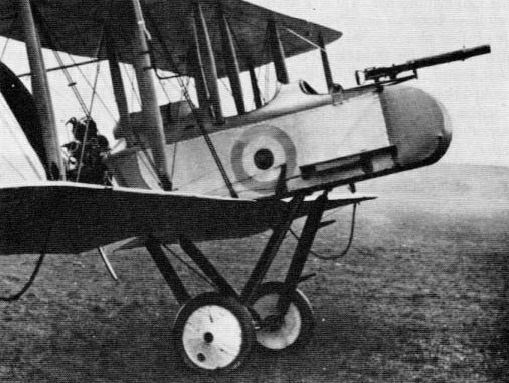 In addition to two fixed Vickers guns there were two Lewis guns on pillar mountings. The foremost pillar was extensible and operated jointly with a protective screen. 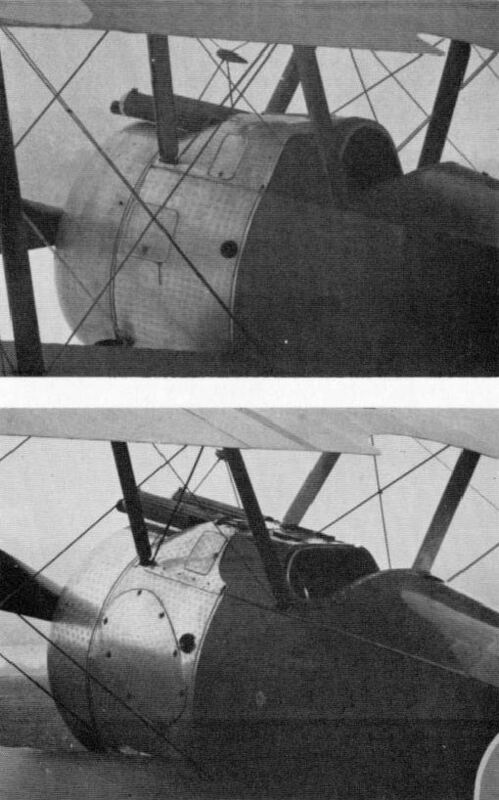 The fuselage of the Sopwith Hippo was so narrow that the Scarff ring-mounting of the second example, shown here, overhung the sides. 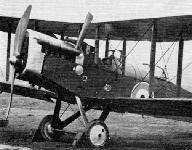 Installation of twin Vickers guns in a Sopwith Dragon. The trigger motors associated with the C.C. synchronising gear are not fitted to the guns, but clearly seen are the protective pads and loading handles at the rear of the guns, the feed chutes and the link chute for port gun, and the windscreen perforated for an Aldis sight. 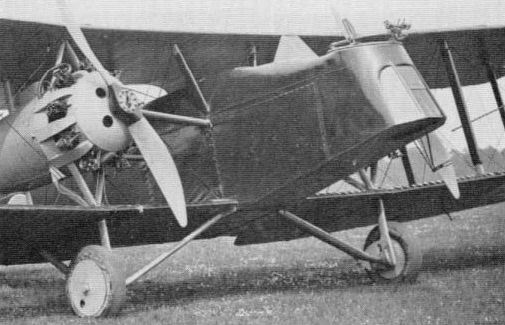 Although it might not be supposed that a rear view of a single-seat fighter could convey much information on armament the reverse is true in this instance. 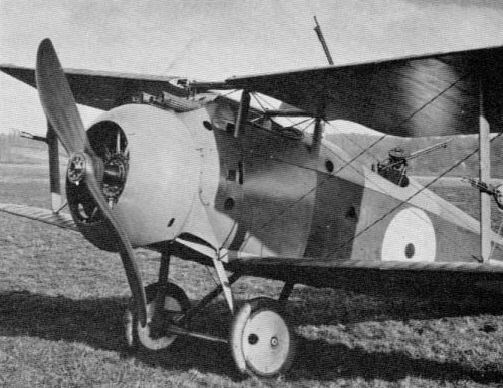 The subject is the Sopwith Snark, and in a frontal view the 'buried' Vickers guns would be invisible. 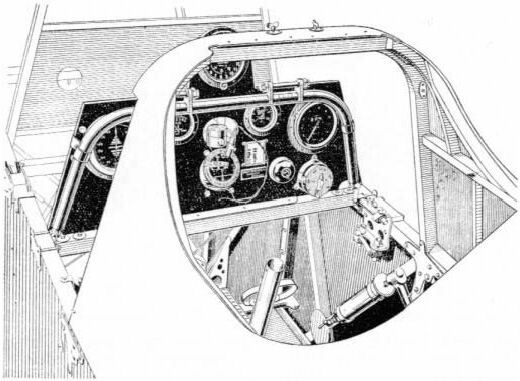 In addition to showing the four panels in the bottom wing, denoting the locations of the outboard Lewis guns, this picture shows brackets for the Aldis sight, slightly to starboard, and mountings for the ring-and-bead sight, the pillar for the bead being canted outboard to the right of the windscreen. 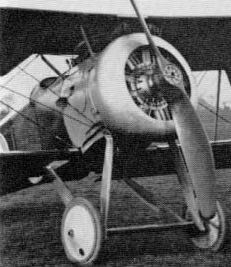 Triplane (Hispano-Suiza); delail showing installation of Vickers gun with Sopwith-Kauper gear and padded rear end. 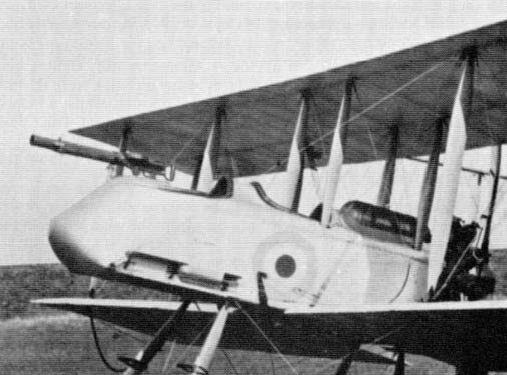 Armed to meet RNAS requirements: the Camel 2F.1 with Vickers gun to port, with ring-and-bead sight mounted on gun, and Lewis gun on Admiralty Top Plane mounting.